The Kentucky Derby this year is shaping up as a bit of an international affair. There are sires from Japan, Canada and the U.S. represented, along with a British great that brings us Code of Honor. Sires from outside of Kentucky can and do produce winners of this race, and the connections of this one will be hoping it happens again. Code of Honor is a nice colt, but one who is hard for us to really get a sense of. Is he good enough to win the Kentucky Derby? 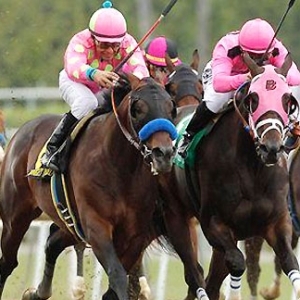 Last race: It is really tough to take anything from the Florida Derby. Maximum Security, a determined front runner, took the lead out of the gate, and extreme long shot Bodexpress followed him. Even though the entire field knew who was going to take the lead early, they somehow let the leaders set very slow early fractions. The dream for any frontrunner is slow fractions, because they still have plenty left down the stretch, and that's what happened here. Code of Honor is a closer, and he did his best here, moving from far back up to third. But the leaders were allowed to run away, and Code of Honor couldn't catch them. So, was it a perfect performance? No. But it was pretty good considering the way the race blew up. I don't know how much it taught us about what he can do in the Derby, though, and that's a little frustrating for a final prep. Prior experience: The colt made his debut in August at Saratoga, and for the only time in his career he won while leading the whole way. It was impressive enough to earn him a trip to the big time, and he made his next start in the Grade 1 Champagne Stakes. He had a rough start in that race and was way back as a result. But he got it rolling late and wound up second. It was a mile race, and it felt like he would have won it with a bit more track. But he didn't get a chance to build on that momentum - that race was at the beginning of October, and he didn't run again until January. He came back in the Mucho Macho Man at Gulfstream, but you can cross that race off. It was just a race for shaking off the rust. He came back next in the Fountain of Youth, and it was his best race. He settled well off the pace, showed patience, and drove consistently through the last turn and beyond to take the lead by about a length. Trainer: Shug McGaughey is such a legend as a trainer that he has been in the Hall of Fame for 15 years already. He has won countless graded stakes along the way, including eight Breeders' Cup races. He won his only Derby in 2013 with Orb and won the 1989 Belmont with Easy Goer - after finishing second in the first two legs of the Triple Crown that year. Despite having been training since 1979, he handles a smaller stable and is more selective than a lot of guys. As a result, he isn't in the Triple Crown mix as often as a lot of guys of his stature. However, when he does show up, he probably has a live one and you need to take notice. Jockey: John Velazquez has ridden this in every race but the Champagne, but we are likely looking at a rider change. Velazquez has long been the first-call rider for Todd Pletcher, and Pletcher has two runners aiming for the Derby - including Cutting Humor, who has been ridden by Velazquez as well. Breeding: Code of Honor is a member of the first crop of British sire Noble Mission. That horse never raced in North America, and was slow to peak, but as a five-year-old he was among the best in the world. He won multiple Grade 1 races, capped by the Champion Stakes at Ascot, which is at the same classic distance as the Derby. Noble Mission is a son of Galileo, perennially Britain's top sire and a very successful runner at the classic distance and beyond. Code of Honor's damsire is the American stud Dixie Union, a grandson of the great Northern Dancer. He was a successful runner, with the Haskell Invitational being his best win. As a sire he had success until his early death, with Belmont winner Union Rags being most relevant here. There is a whole lot of impressive stamina in this pedigree, and the Derby distance is not going to be a concern. Odds: Code of Honor sits at 20/1 in the final Kentucky Derby futures pool, which puts him behind eight other runners. BetOnline currently has him at 16/1 to win the race. Can Code of Honor Win the 2019 Kentucky Derby? : Yes. He's not going to be my top choice, and it will depend upon who will be riding him. The distance is not going to be a concern for him, and there will be plenty of early pace to run behind. Therefore, if everything falls into place and he has some luck, he could pull it off. He'd have to be close to that BetOnline price to be worth a look, but he'll be a part of my exotics. Want free Kentucky Derby picks for 2018? Our experts are the best Kentucky Derby handicappers in the nation, and you can get their picks free (first-time clients only), Get $60 worth of Kentucky Derby premium members' picks free .